It's that time again! Boutique Blowout 2015 will be here next week. 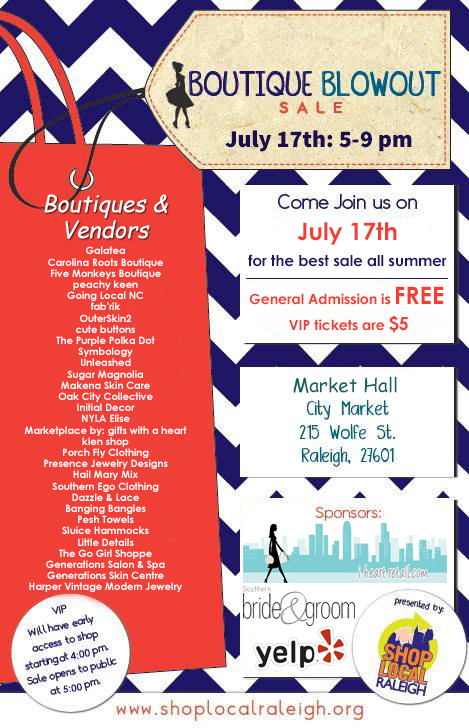 This one day shopping event hosted by Shop Local Raleigh will feature over 25 local vendors selling their merchandise at deeply discounted pricing. This fabulous event will take place on Friday, July 17, from 5-9 p.m. in Market Hall in City Market in Downtown Raleigh. I attended last year with Mane Angels and had an absolute ball! The prices at the event were fabulous and I scored this cute, leopard bardot top last year for under $10! Tickets are on sale! General admission to the event is free and VIP tickets, which entitles you to shop one hour early, are only $5!. Get tickets here. I'm excited to share that, thanks to Shop Local Raleigh, one of you will be able to win two tickets to Boutique Blowout 2015! The giveaway details are below. The giveaway will run from Wednesday, July 8 to Tuesday, July 14. The winner will be announced on Tuesday, July 14 via Facebook and Twitter. An e-mail will be sent to the winner and a response must be received within 24 hours or another winner will be chosen. 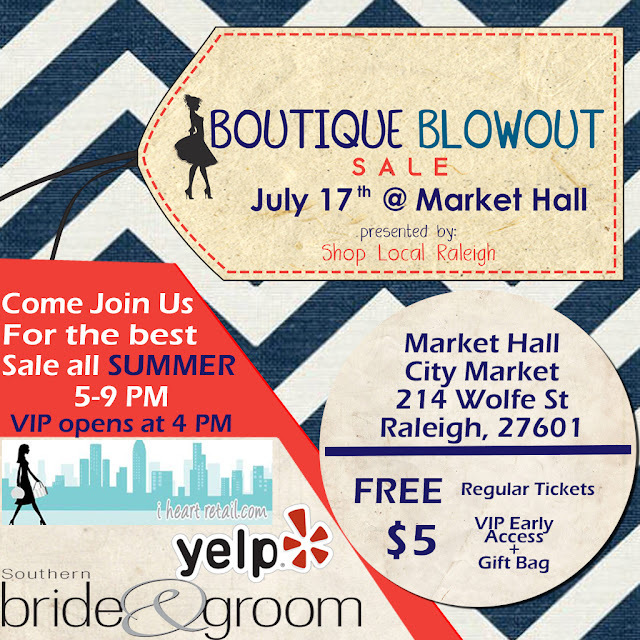 The tickets are only valid for Boutique Blowout 2015. Thank you again to Shop Local Raleigh for sponsoring this giveaway!